Pobst wasn't blown away by Godzilla, ranking it only fifth due to a tendency to snap into oversteer at the limit (a behavior easily mitigated by not switching off the various stability systems). 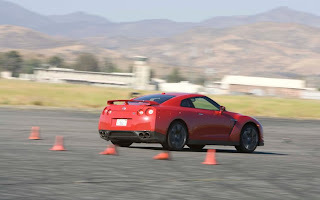 The rest of us, though, came away from our handling test thoroughly bowled over by the Nissan GT-R (2nd place). A review of the numbers shows high finishes everywhere: third in ride quality, fastest lane change, fifth in step-steer reaction time, quickest off-center steering response, a near-textbook figure-eight trace. Nissan's computerized, all-wheel-drive superstar works wonders, delivering lofty performance numbers and the deft handling feel that enthusiasts crave. So why didn't it win? As noted, its limit behavior when its stability computers are sleeping can be tricky. And while the GT-R is undeniably majestic at full bore, at more routine chores its supercar breeding vanishes. "Almost boring when all the computers aren't firing away," said tech editor Reynolds. "On the cruise home it felt like a Sentra."